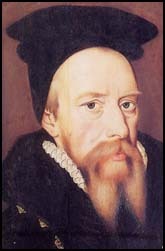 Here’s an Elizabethan letter that offers a glimpse into the character of Edward de Vere Earl of Oxford as a hot-blooded young man in search of adventure, learning and freedom from his conservative English society, particularly freedom from the puritanical gaze of Lord Burghley, his former guardian and current father-in-law. 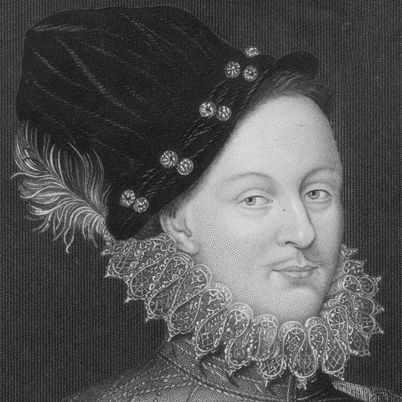 The writer, William Lewin, acting as Oxford’s servant but reporting to Burghley, tells how the earl is quickly “taken by a surfeit” of sensual pleasures and “delights [in] his ability to hide.” It also shows how someone writing to the Queen’s powerful chief minister feels constrained when discussing those sinful doings in Europe, especially on the other side of the Alps in Italy. 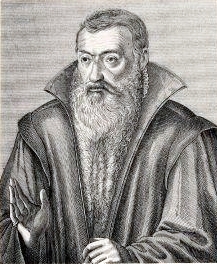 Lewin wrote to the Lord Treasurer from Strasbourg, Germany on July 4, 1575 after Oxford had met with Johannes (Jean) Sturm, 68, the great humanist educator (who favored a “non-dogmatic” Christianity) and supporter of the Protestant Reformation. Lewin had been directed by Burghley to keep him informed of Oxford’s doings on his Continental tour, which had begun in early February and had already included a successful visit to the French royal court. Lewin had accompanied his 25-year-old “master” from Paris to Strasbourg, but then Oxford managed to slip away from him and disappear. Lewin reports his opinion that Burghley is more concerned about Oxford’s “security and safety” than the earl himself. Clearly he’s frantically trying to learn Oxford’s whereabouts and, perhaps more importantly, worrying about the chief minister’s reaction to this bad news. As we shall see, he even attempts to turn the crisis from a negative situation into a positive one. 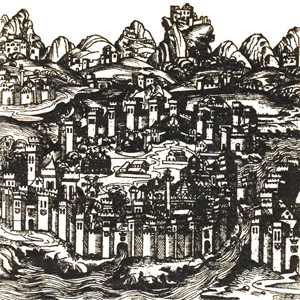 “I am aware that your Lordship disapproves of a journey to Constantinople, and are even greatly concerned about an Italian sojourn, in both cases very prudently,” Lewin continues before launching into his philosophical solution – the idea that if Oxford indulges in guilty pleasures excessively enough, he will be cured of wanting to indulge in more! “As much as I can make out from those who have completed a significant part of it,” he writes, “that journey to Greece makes those who had previously been eager to be pilgrims zealous for staying in their homeland. It makes those who love foreign things love their own, and those who disdain their own to scorn the foreign. This I certainly gather on the basis of our French journey, and suspect it on that of our German one,” he assures Burghley — telling him what he wants to hear, true or not. 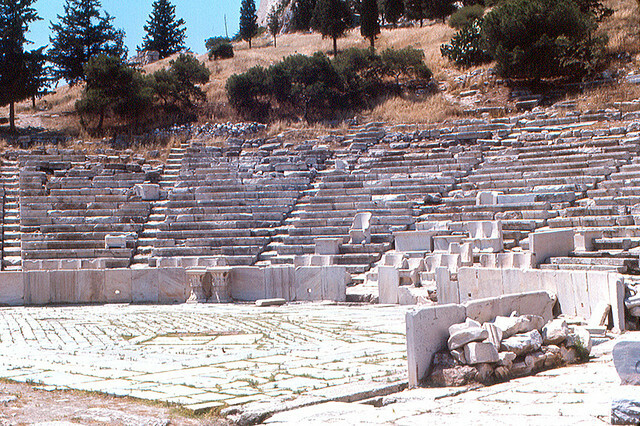 The Theater of Dionysus in Athens, on the south side of the Acropolis, where plays of Sophocles, Euripedes and Aeschylus were performed: Did Oxford make his way to Greece ... and here? “For your Lordship is not ignorant how quickly he is taken by a surfeit of these or similar things. But, you will say, Italy abounds with a variety of all the pleasures. Certainly it is rife with all manner of sensual pleasures, but these are not the most solid or the longest-lasting ones, but rather those from which those of the greatest good taste are most quickly estranged. 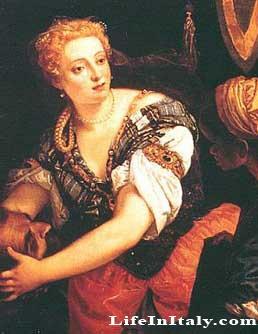 The famous Venetian courtesan Veronica Franco (1546-1591); another courtesan, Virginia Padoana, was said by an English traveler to "honoreth all our nation for my lord of Oxford's sake." All such pleasures “may be found in Italy,” Lewin writes, “not to a small degree, but in abundance. One does not have to seek them out, they are offered to him. As assuredly they purvey disgust and offense, particularly concerning those things which entail a certain natural surfeit. So what is to be done? This is primarily for you to decide,” he tells Burghley. “I do not know what I should do beyond using my letters to place before his eyes the richer pleasures of refined learning as a contrast to those Italian ones. If only Lewin knew he was trying to catch up with the young man who would go on to write Romeo and Juliet, The Merchant of Venice and other great plays with Italian settings … if only he knew his elusive “master,” upon whom he’d been told to spy, would become “William Shakespeare”. Whoever wrote this letter need not ever worry about having to buy lunch. Ha! Let’s both take him out to lunch, on us!